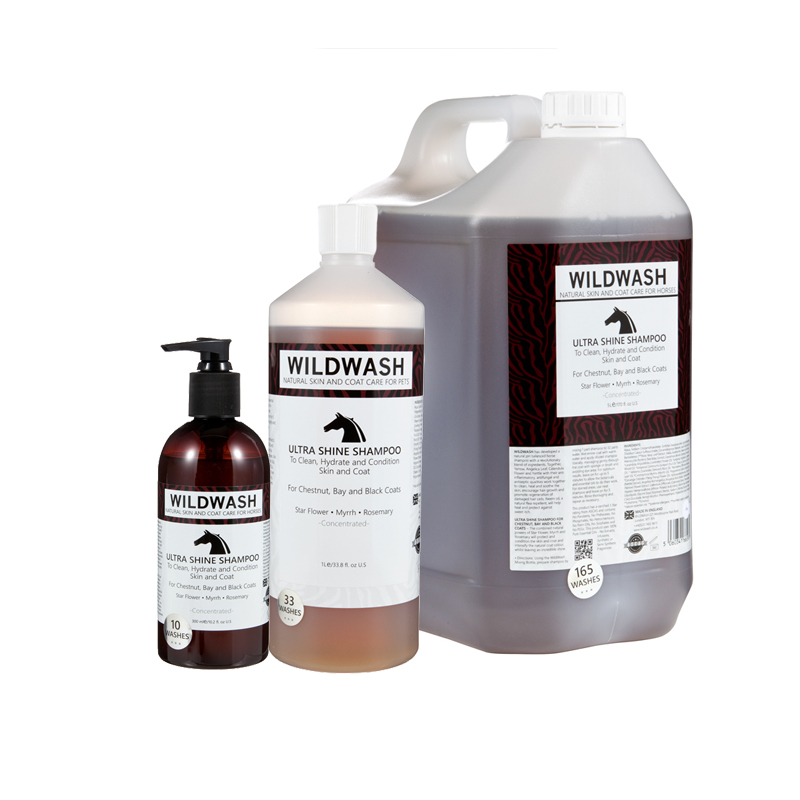 Wildwash Ultra Shine Horse Shampoo cleans, hydrates and conditions and is specifically designed for Chestnut, Bay & Black Coats. WildWash has developed a natural pH balanced horse shampoo with a revolutionary blend of ingredients. Together, Yarrow, Angelica Leaf, Calendula Flower and Nettle, with their anti inflammatory, antifungal and antiseptic qualities, work together to clean, heal and soothe the skin, encourage hair growth and promote regeneration of damaged hair cells. Neem oil, a natural flea repellent, will help heal and protect against sweet itch. The combined natural powers of Star Flower, Myrrh and Rosemary in this shampoo will protect and condition the skin and coat and intensify the natural coat colour, whilst leaving an incredible shine. Using the WildWash Mixing Bottle, prepare shampoo by mixing 1 part shampoo to 32 parts water. Wet entire coat with warm water and apply diluted shampoo liberally, massaging gently through the coat with sponge or brush and avoiding eye area. For optimum results, leave on for up to 5 minutes to allow the botanicals and essential oils to do their work. For stained areas, use neat shampoo and leave on for 5 minutes. Rinse thoroughly and repeat as necessary. 1 Litre will last approximately 33 washes, if used with the mixing bottle. For any new skin product, we recommend you do a patch skin test before your first full application.